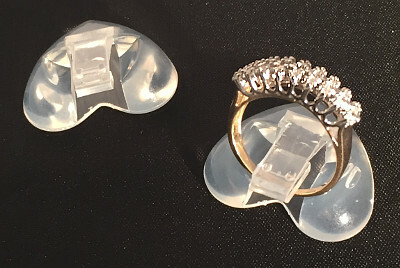 Acrylic Clear Ring Display Clip Stands. Sturdy base plastic acrylic Ring Stands in Packs of 20. Base size approx. 30mm x 25mm. Display jewellery rings easily and professionally using these ring clip display stands. Fits most standard ring sizes and designs. (Quantity x 20 per. pack). Dimensions: 30mm x 25mm base approx.